Hello everyone. Here is the first part of a series of articles about the "Disneyland Paris that never was", and this is a new version of the one previously released some years ago, with new and better scans and some surprises. As you know, when WDI imagineers begin to think about a new park or attraction, the phase one is call “blue sky”, everything in this phase one can be imagined as there is still no limit that the final budget will put inevitably. Then, from the blue sky comes the comeback to earth and choices must be done. Mind you, it’s not that the imagineers love to do some “cut” in their wonderful concepts as they are always pleased to enhance any project or put more theming details when it’s possible. The best example is Tokyo Disney Sea although even with this one some choices had to be done like with the “Voyages of Sindbad attraction which had a different first concept than the actual one with its oriental “small world puppet” theming. To come back to DLP, and although the budget for the park back in 1990 was high, the imagineers had to make choices. Most of the time, they’ve kept the best. Sometime, as we will see, the project they had in mind was really too expensive...others were not really that expensive but the park’s management decided to do some “cuts”. It’s always the same thing when we look at renderings of “never done“ projects: we want this one to be built immediately! .........and we forget that what we already have is great! So, most of these coming projects will never exist, although, as they say at WDI “a good idea never die”. Let’s just dream about them, leave your mind enter the art-work and imagine that it’s real. To begin by the beginning, the first picture below show you a model of the park, and, that’s how it looks before the imagineers decided to add Autopia, with the Disneyland Paris hotel at the entrance. You may have not noticed it but the map of EuroDisneyland at the top of this article have an interesting detail. If you look at Discoveryland's entrance on the left of the Orbitron you'll see a structure which was never built. WDI Imagineer Tim Delaney had envisioned to build the Alien Encounter attraction at DLP's Discoveryland - in front of the Visionarium building and the Constellations shop, and this is a rare proof of the project. Although the words "Alien Encounter" are not written on the map you can see clearly the two theaters of the attraction on the picture detail below. Unfortunately the attraction was cancelled. This rendering below show you a pretty different park's entrance, with two small lake where the fantasia gardens are now, and a big one at the bottom with a wharf and a boat where now stands a big boulevard. This town square rendering shows main street entrance with coconut trees. This image depicts an early concept when the disneyland Paris Hotel was inside of Main Street U.S.A and the left side shows the resort architecture of a grand floridian style hotel. The coconut trees were part of that idea. The Disneyland Hotel was indeed built but this two next artworks show a slightly different architecture and a much bigger pool too. ...You'll note that the coconut trees are back! I will come back soon on the Main Street that never was with a brand new article as we were at two fingers to get a really different Main Street than the one which now exist. Instead to have a “turn of the century” theming, Eddie Sotto - DLP Main Street show-designer - had designed a Main Street set up at the 20’s-30’s with a totally different look. This next artwork show Central Plaza and all we can see on it exist in reality but you'll see some Christmas season decor at the center of the plaza which, them, don't exist. What i miss the most is the great voice of Vincent Price who was recorded - as Phantom Manor ghost host. For a little while , at the opening of the park , visitors were welcomed by Price’s voice, until it was realised that this only english version was not understand by the french audience.....But the ghost laughs that you can hear during the ride are still Vincent Price laughs! A little story about the recording session: when it was recorded , Vincent Price was already at the end of his life , and really tired, physically speaking. So, the agreement was that Price could come for the recording , but just for one hour. Everything was ready, and Price arrived at the recording studio. He look really tired and everybody hoped that he could do it right....then he begin to read the text, and , all of a sudden , it was magical. A few takes were done, and that was it! Probably one of the last thing that Vincent Price did with all his genius. However, all is not lost , as this recording was released on the Haunted mansion anniversary cd , that you can still find easily. On the picture below around Vincent Price are Imagineers Al Vasquez behind the camera, Jeff Kurti is behind Vincent Price and the woman on the right is Gabrielle Reynolds. Another concept never realised for Frontierland was this small wood carver shop. But the most surprising is probably this Lil' Big Thunder ride concept by Julie Svendsen - Obviously inspired by Disneyland extinct attraction "Mine Train through Nature's Wonderland" it was a kind of Big Thunder family coaster for young kids going through "rainbow caverns", Geysers, friendly cactus, rolling stone balls and even a mine blast! Don't miss the next parts of these Disneyland Paris that never was articles, coming soon! 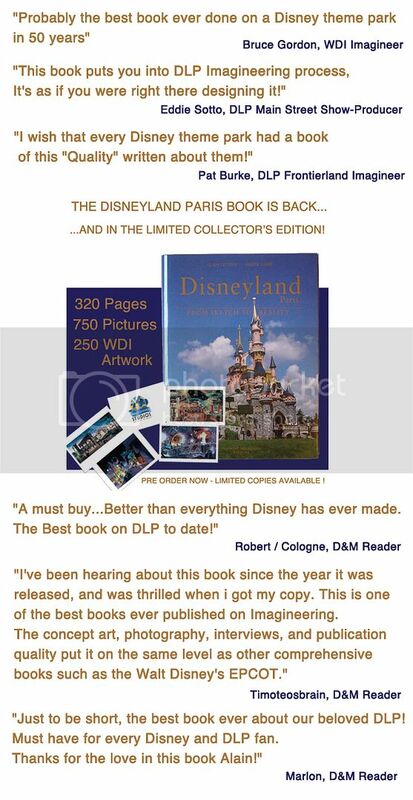 If you love Walt Disney Imagineering artwork you must not miss the Disneyland Paris "From Sketch to Reality" book which will tell you all about the creation of Disneyland Paris with 320 pages including 500 pictures of the park and 250 WDI renderings! The book have currently a special offer and is now available with immediate shipping! Reviews from all who have already received the book are "over the top"! Place your order now for the new gorgeous updated edition copy while it's available at the pre-order price! Alain, this is why your site is one of my favorites!